Recreational marijuana vendors say they're excited and apprehensive as California launches a massive new legal weed industry. Tuesday marks the second day of state-authorized recreational pot in some cities in California. 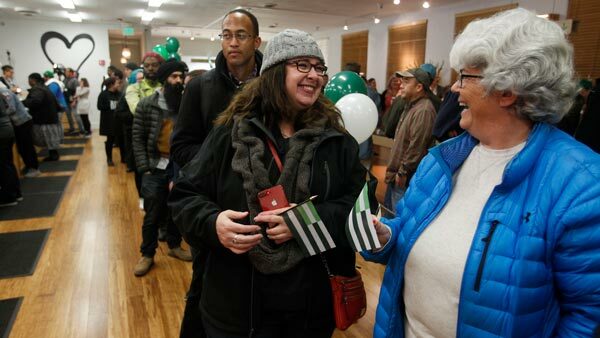 The first hours of legal sales saw long lines at some of the roughly 100 shops that have managed to get their state licenses so far. A pot shop in Santa Cruz was celebrating with a banner declaring: "Prohibition is over." But state and local governments have a lot of work to do to launch an industry expected to bring in $1 billion in tax revenue each year. State Cannabis Bureau spokesman Alex Traverso says regulators worked through the holiday to try to process 1,400 applications for various pot businesses. Charles Boldwyn of a Southern California pot retailer says the regulations could cause shortfalls in supply.